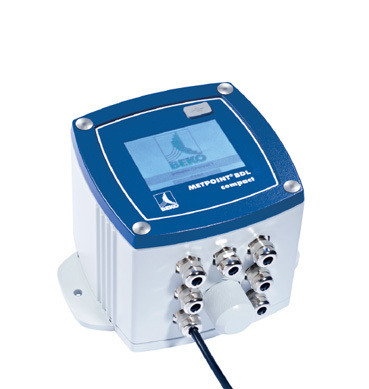 The BEKOMAT drains condensate in the compressed-air system in an electronically level-controlled manner. On-site processing of the oil-containing condensate by means of ÖWAMAT oil-water separation systems is always more favourable than the cost-intensive disposal via specialist companies. With BEKOSPLIT, the independent, particularly cost-effective processing of stable emulsions is possible and useful for every company. Unnecessary costs and damage during the generation of compressed air can only be avoided in an efficient way with amount-adjusted condensate drainage. 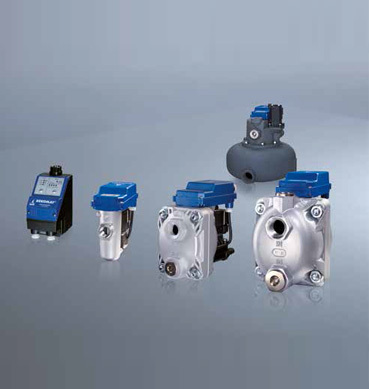 Therefore, BEKOMAT condensate drains operate with a capacitive sensor. The intelligent electronics prevent compressed-air losses and minimise the energy demand. 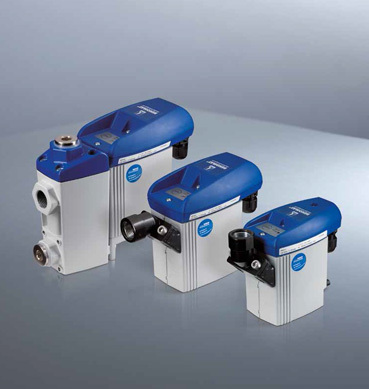 As a result, the BEKOMAT often pays itself off within half a year already, in contrast to devices with timed drain valves. The comprehensive product portfolio offers the optimum device for every compressor type and performance, for every system pressure, and for all operating conditions. BEKO TECHNOLOGIES transforms its international experience of more than 30 years into a new BEKOMAT generation. With innovations which offer unprecedented advantages to the users. BEKOMAT 31U/32U/33U and 33UCO combine new solutions and significant advances in technology. Even more reliability, fast and smooth installation, maintenance with minimum time requirements BEKO TECHNOLOGIES achieves these targets through an innovative construction which consists of only two or three units with quick release connectors. This means the new BEKOMAT can be serviced in seconds, without decoupling from the pipework system. The devices of this new generation are made up of only two modules: a service unit com- prising the corrosion-resistant aluminium housing together with all maintenance-relevant components, and an electronic control and sensor unit which is installed only once. Both modules are coupled via a practical snap connection. This design makes it possible to replace all parts subject to wear or requiring maintenance in one go: the old service unit is simply and quickly removed and a new, works-tested unit is fitted instead. The separation and connection of the two modules requires no tools - it's all done in next to no time. If the condensate from the intercoolers is not reliably drained in multistage compressors, it will reach the next compressor stage. BEKOMAT LA/LP prevents damage through “drop attacks”, condensate build­up and water hammers. Especially employable for condensate drainage in vacuum or pressureless systems at operating pressures from 0.1 to 1.8 bar (abs.). Special units are also available for the application in hazardous areas (II 2G EEX ib IIB T4 / explosion class II B, temperature class T4) where ignition sources need to be prevented. Permissible fluids are ethane, methane, town gas, diesel fuel, ethylene, propane, fuel oil and compressor oil. For the drainage of particularly aggressive condensates. One litre of oil contaminates 1,000,000 litres of ground water. Therefore, the legislator stipulates professional and responsible handling of emulsified condensates and oil-contaminated industrial wastewater which accumulate during many production processes. Processing according to purely physical gravitational separation is not sufficient. A more economic solution for an environmentally sound condensate management is the decentralised oil-water separation directly at the source. Condensate which was processed with ÖWAMAT can be directly introduced as cleaned water into the sewerage system. The devices have a national technical approval and do not require a permit according to the law on water. 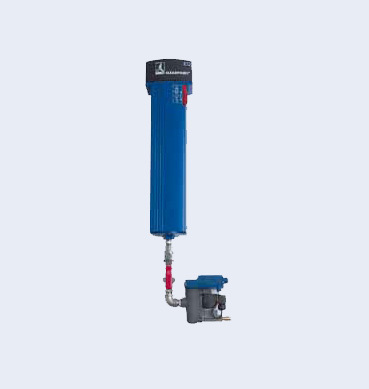 In addition, the ÖWAMAT oil-water separators do not create any energy costs, boast enormous filter service lives and can be retrofitted into older systems without difficulty. With this, the ÖWAMAT meets the highest demands on sustainability, efficiency and cost-effectiveness. The continuously high performance of the ÖWAMAT requires the use of optimum replacement filters. Inferior filters lead to bad separation results, reduced service lives, more frequent replacement and, therefore, to avoidable extra costs. In addition, the entire guarantee will expire if external or counterfeit components are used. 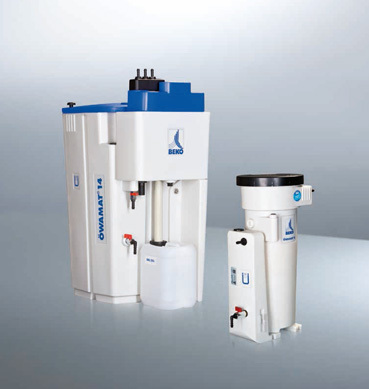 OEKOSORB replacement filters ensure the reliable and economic functioning of the ÖWAMAT. Moreover, all legal requirements (Water Ecology Act) are met by employing the original replacement filters. The CLEARPOINT filter technology guarantees low operating costs, long service lives, outstanding process reliability and the safe filtration of aerosols, oil and dust. The comprehensive range of products covers a performance spectrum between 35 and 34,680 m³/h (at 7 bar) and includes threaded and flanged filters, as well as high-pressure filters up to 500 bar. Through the innovative 3E filter elements (3E = Energy Efficient Element) and a flow-optimised, corrosion-protected housing construction, CLEARPOINT offers safe and reliable filtration and qualitatively better compressed air at significantly reduced operating costs. CLEARPOINT high pressure filters will give you a decisive added value compared with other brands in this filtration sector. Both reliability and efficiency are significantly increased. The designs are carefully tailored, down to the smallest detail, to the specific requirements of high pressure systems. Piston compressors inevitably produce pulsations in the compressed air flow. The resulting vibrations can cause leaks in conventional filter housings. 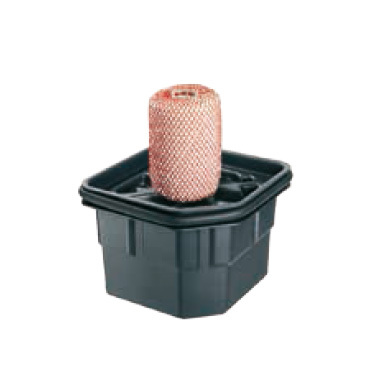 CLEARPOINT filter housings are provided with a special retention system to ensure that the unit remains leakproof. An important safety feature is the CLEARPOINT filter cap which prevents accidental opening of the housing. If the operator tries to open the housing when it is still under pressure, a clear warning signal will be heard. 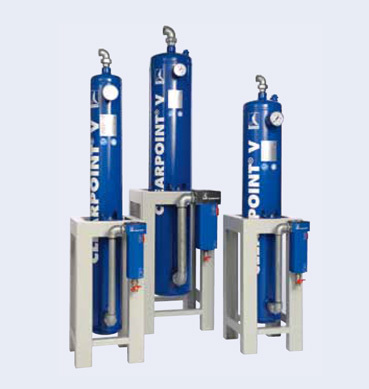 To ensure the best compressed air quality, particularly in sensitive applications where residual oil content is an imperative, Clearpoint V activated carbon adsorbers provide an attractive and cost efficient solution. With Clearpoint V a maximum oil content of 0.003 mg/m³ is reliably achieved even in demanding conditions, and dust filtration is standard. An indispensible process-related component for superior performance. With considerably enhanced process reliability, the DRYPOINT dryer technology offers decisive advantages for every field of application. The BEKO TECHNOLOGIES portfolio comprises application-optimised refrigeration, adsorption and membrane dryers for volumes up to 1,500 m³/h. This range of dryers is completed by heat-regenerated EVERDRY adsorption dryers which are designed for large volume flows up to 20,000 m³/h. Due to the characteristics of the system, a strong pressure drop occurs during the operation of compressed-air plants when using conventional adsorption dryers. To compensate for this deficiency, increased compressor performance and therefore higher energy input is required. 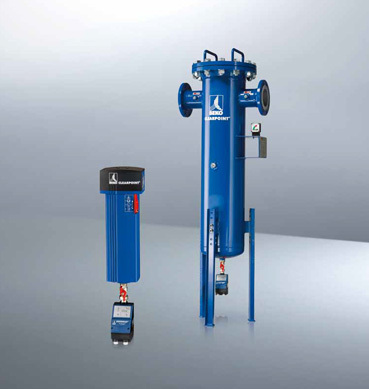 Cold-regenerated DRYPOINT AC adsorption dryers offer a convincing solution to this problem: they limit the pressure drop, including pre- and afterfilters, to only 0.35 bar on average. In this way, the pressure loss is lowered by 50% compared to conventional constructions. Due to the saved energy costs, the DRYPOINT AC will pay for itself within three years on average. Where work takes place under high pressure, the demands on the safety and reliability of a system are particularly high, as the compressed air is significantly more contaminated by solid particles, oil and condensate as a result of the enormous compression. 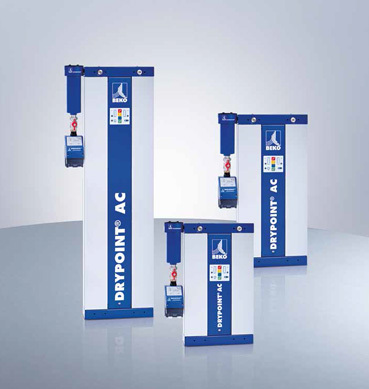 DRYPOINT AC HP is the pivot of an efficient and safe high-pressure system. The premium high-pressure dryer reliably and economically removes humidity and contaminations from the compressed air. It is particularly cost-effective to dry precisely the quantity of compressed air which the customer actually needs. However, the full saving potential can only be used when this amount of compressed air is dried exactly to the respectively required degree. With this, drying is directly geared to the application itself. What is generally required is highest reliability and immediate availability of the compressed air. This applies in equal measure to laboratory purposes, to applications in workshops or outdoors, whether mobile or stationary. It is not the investment costs that determine the cost efficiency calculation regarding refrigeration dryers – but the operating costs. Considering an operating period of five years, only between 20 and 30 per cent of the total costs are allotted to the pure investment, while 70 to 80 per cent are allotted to the ongoing operating costs. These costs are split equally between electricity costs, flow resistances in the system and compressed air losses through leaks. Pressure drop at critical spots must be compensated by enhanced compressor performance and the resulting additional energy demand. With DRYPOINT RA, these operating costs can be reduced by almost half, considering a period of time of five years. In the return-on-investment calculation, the full potential of the new refrigeration-dryer generation is proven: the dryers pay off within an operation time of only six months. 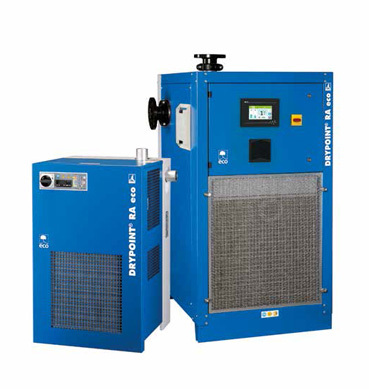 The air-cooled DRYPOINT RA compressed air refrigeration dryers complement the BEKO TECHNOLOGIES dryer programme with another cost effective alternative. The comprehensive RA model range of products allows optimum adaptation of the compressed air processing to individual operating conditions. All models excel in minimum pressure loss even with varying work loads and in their low energy consumption. 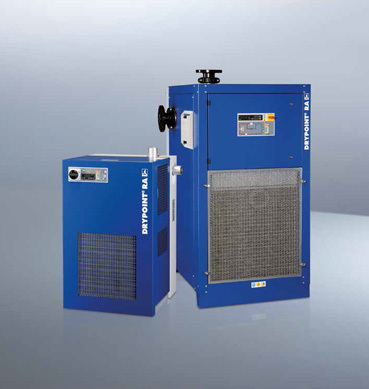 The standard series comprises refrigeration dryers with performances from 20 to 13,200 m³/h. The new generation of refrigeration dryers unites economic ambitions with ecological responsibility. With the DRYPOINT RA eco product line, the definition of profitability was newly defined. Through the entirety of the technical properties, the pressure losses, compressed-air losses, and energy consumption could significantly be reduced. At a varying compressed-air withdrawal, the energy consumption has now optimally been adjusted to the demand. In such a manner, up to 70% of the operating costs can be saved during partial load compared to conventional refrigeration dryers. DRYPOINT RA eco is based on a proven product and expands it by an intelligent energy concept. DRYPOINT RA eco stands for optimised resource efficiency: its field of application lies where compressed-air systems and products need to be reliably protected against condensate and contamination. Drying takes place by cooling down the air. The condensate that accumulates during this process is efficiently discharged by means of the BEKOMAT, without compressed-air losses. Reheating reduces the relative humidity of the dried air to below 30%. The consumed amount of energy is adjusted to the required drying performance. This method saves energy costs and protects the environment. For this reason BEKO TECHNOLOGIES offers application-optimized products for the treatment of compressed air. 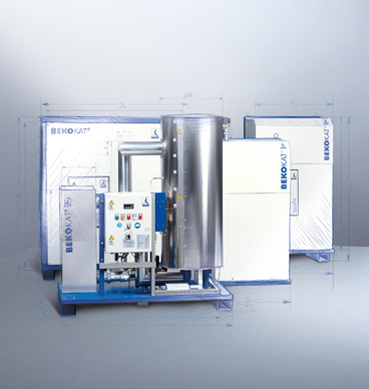 Refrigeration dryers, adsorption dryers and membrane dryers have been part of our product spectrum for many years. The key to the successful optimisation of compressed-air systems is data. 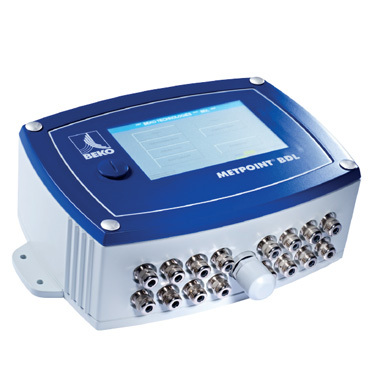 The METPOINT® range of measurement equipment with sensor technology and monitoring provides the data base for the evaluation and assurance of the compressed-air quality and for the identification of hidden cost drivers. Our measurement equipment can also be employed for the extension of plants and for the early elimination of malfunctions. What about the residual oil content, residual humidity, volume flow and pressure in your production? Probably you know that these are the decisive parameters for the quality of compressed air used in your processes, and the efficiency of your production. But do you know what they actually ARE? With our sensor technology, you can capture all these data pa-rameters – constantly, faultlessly and with exemplary precision. Humidity in compressed air is a well-known problem and can lead to severe consequential damage. In particular in demanding applications, malfunctions in production plants can have serious consequences. Costly standstills and increased expenses for deficient products and quality assurance quickly add up. Through the precise detection of the current volume flow, components of a system can be dimensioned in a particularly cost-effective manner through the fast and unmistaken identification of possible overload such as air velocities which are too high or malfunctions. The exact assignment of consumption proportions to individual production stages also offers possibilities for fact-based, economic decisions. Moreover, the volume-flow measurement indicates the amount of compressed air lost as a result of leaks – an important economic factor, as every third compressor is operated only to compensate for air losses. 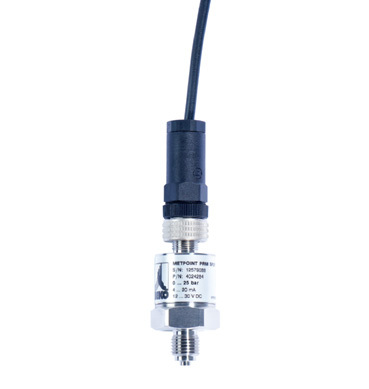 The METPOINT® PRM pressure transducer detects the relative pressure (gauge pressure) in gaseous and liquid media and transforms this measured value into a linear output signal. Pressure transducers transform the physical pressure into a pressure-proportional electrical signal. 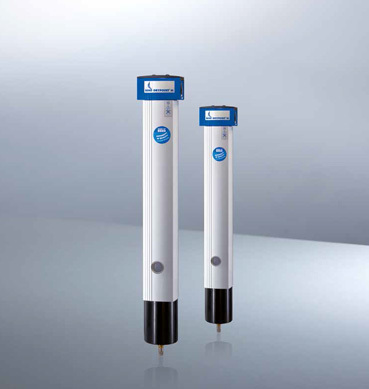 As regards the METPOINT® PRM, sensors of the thin-film technology are employed. The body and membrane of a metal thin-film sensor consist of a 1.4548 stainless-steel material. On the membrane side that faces away from the medium, insulation layers, strain gauges, compensating resistors, and conductors are applied with a combination of chemical and physical methods, and are photolithographically structured through etching. The layers of the resistors and electrical conductors applied on the sensor are considerably thinner than a micrometer and are, therefore, called thin-film resistors. Due to the materials used, the metal thin-film sensor boasts very good resistance to many media, and it is insensitive to shocks and vibration impacts. This leak detector detects every leak. Precisely and quickly. Minor cause – major effect. Small leaks can already make up a large part of the costs for compressed air. Leakage rates of 30 % are not a rarity. In times of rising energy prices, huge amounts of money are quickly „blown into the air“ in this manner. A remedy to this is the small and easily operable METPOINT® LKD Leak Detector. With this device, the leaks in the system can be detected within a short time. Therefore, short-notice pinpoint maintenance is possible. 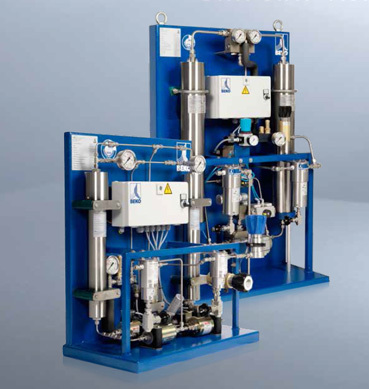 You require constant high-quality compressed air for your processes? Then it is important to monitor all parameters constantly. Even the smallest deviations from the norm can have serious consequences for your plants and your production. Our Monitoring makes all the relevant data accessible to you and your employees at a glance, ensuring the safety of your processes and the quality of your products. In this way you can take your energy management and quality control requirements to the next level of success. In combination with the consumption rate analysis, daily, weekly, or monthly evaluations can be calculated with the costs and counter reading. 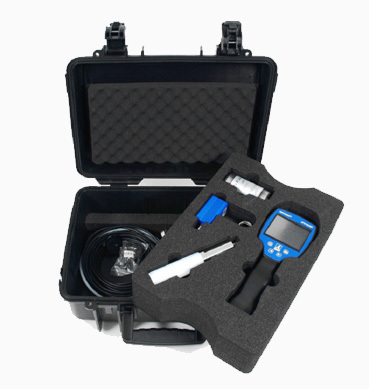 The METPOINT® BDL portable enables mobile data logging and allows users to evaluate the quality of compressed air right on site. 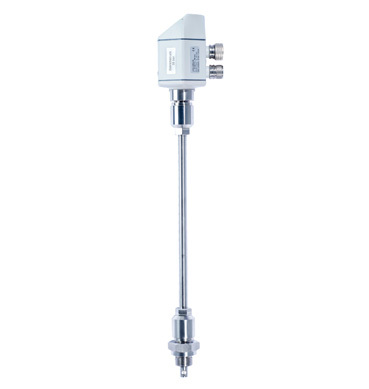 Universal sensor inputs ensure easy and convenient connectivity with all conventional industrial transducers. In addition, the device is intuitive to operate using an easy-to-read 3.5" touchscreen. It is possible to store up to 100 million measured values, along with the date and name of location, and to display that information in colour graphs. Users are able to conveniently transfer the measurements to a PC using a USB stick and continue analysing and interpreting the data with evaluation software. Compressed air which is contaminated by oil is a danger for production plants, the environment or even for health. "Oil-free" compressors are no guarantor for "oil-free" compressed air because of the ambient air/induction air. In most cases, a certain residual oil content cannot be entirely avoided in standard applications. Precise monitoring of the oil vapour content which is possible at all times is therefore all the more important. 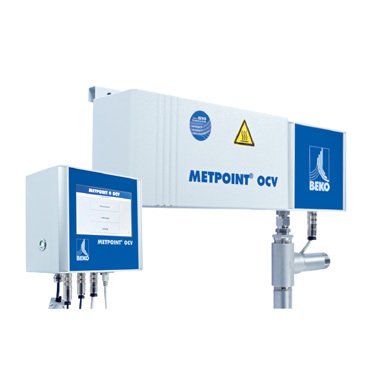 METPOINT OCV is the first TÜV-certified* online system for the detection of the oil vapour content in compressed air. The measuring system can be used to protect the production or products. The obtained data are used for both the documentation of the compressed-air quality and the identification of contamination sources. 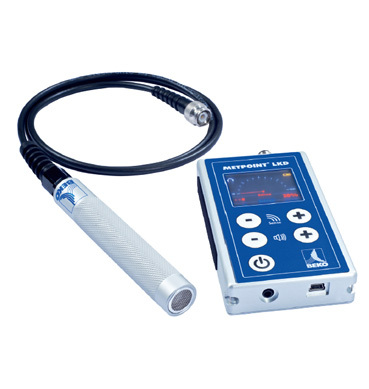 The METPOINT® MMA serves to continuously and reliably monitor the quality of breathing air. This compact measuring device was especially developed for use in hospitals. With the evidence regarding the adherence to the legally stipulated limit values of components and contaminants being provided, pharmacists in clinics comply with the legally binding obligations of the European Pharmacopoeia. The entire cycle for medical compressed air is continuously measured. 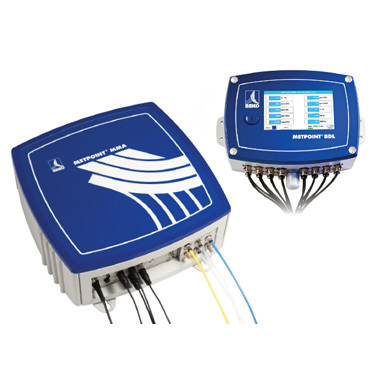 The METPOINT® MMA simultaneously monitors seven defined parameters of the central compressed-air station. On-site access to data and information in real-time is critical to a number of production and treatment processes when it comes to directly evaluating the quality of applications and processes and the ability to intervene, if necessary. Thanks to the METPOINT® UD01 plug-on display, users can now display measurement data right at the source: the transducer. 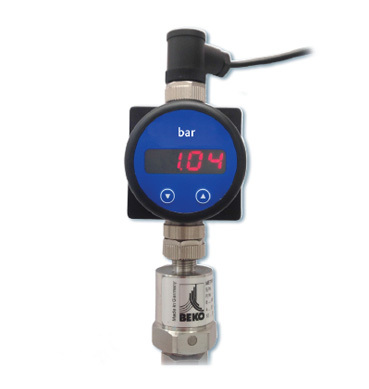 In addition to the practical overview of the current process para-meters, the measured values can also be transferred without any hassle to a data logger, such as the METPOINT BDL, or to a higher-level control system. Production processes can be optimised with the pathbreaking process technology of BEKO TECHNOLOGIES. Economic plant operation, reduced cycle times and an increase in productivity are only a few of the advantages. 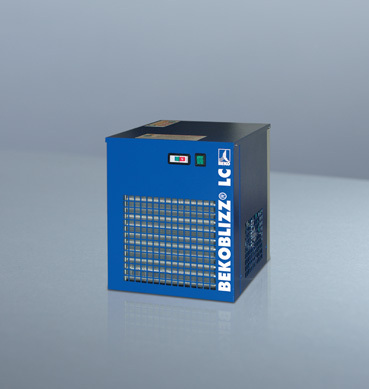 The BEKOBLIZZ LC compressed-air cooler cools economically with cold compressed air (+5 °C), without using CO2 or N2. In most cases, an increase in production and quality stands in direct relation to the quality of the compressed air applied during manufacture. This applies particularly to cooling processes. 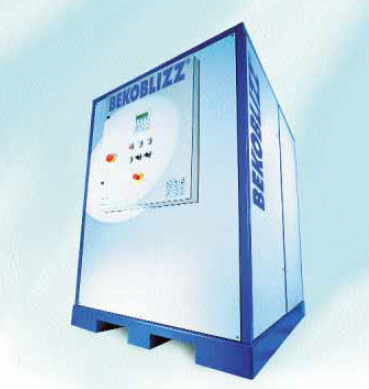 The BEKOBLIZZ compressed-air freezing system supplies top-grade, dry compressed air with lowest temperatures constantly down to below -35°C / - 45°C. 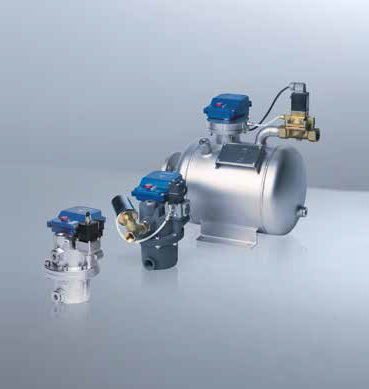 BEKOBLIZZ LC cools economically with compressed air with a temperature of +5°C – without applying CO2 or N2. The compressed-air cooler is employed, for example, in the laboratory, in the workshop or in production. 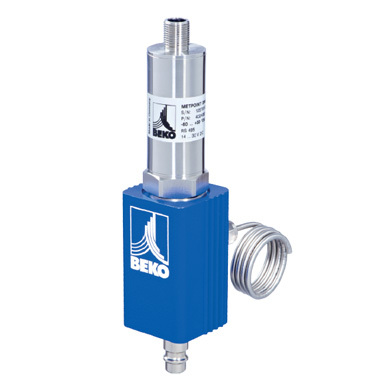 At BEKO TECHNOLOGIES , service does not end with the provision of high-quality products and solutions.We also offer comprehensive services, such as the cleaning and maintenance of your compressed-air plant; volume-flow, pressure and leak measurements, and online calculation tools for the efficient planning of your compressed-air system. Our service portfolio also includes an interactive eLearning offer, acquainting you with the most important aspects of compressed-air technology. Play it safe as far as oil-water separation is concerned. The regular maintenance of a BEKOSPLIT® or ÖWAMAT® does not only ensure their proper functioning. The processing and disposal of compressed-air condensates and emulsions according to good professional practice is also required by the building authorities (Deutsches Institut für Bautechnik). Decide in favour of the safe solution: the professional services of BEKO TECHNOLOGIES. Professional service on which you can rely. As a specialist company, BEKO TECHNOLOGIES GMBH is authorised in accordance with Article 19 of the Water Ecology Act to carry out services on oil-water separation and emulsion-splitting plants. As a specialist for top-grade compressed-air processing and condensate management, we are very familiar with your operating requirements and the legal stipulations. Our competent staff members carry out on-site maintenance once per annum. In this way, you will save unnecessary downtimes and working hours of your valuable employees. Our specially equipped vehicles also reduce time and effort and therefore unnecessary costs. In addition, our specialists establish the maintenance report which is important for you. This report provides information on the implemented functional checks and confirms the completeness and plausibility of the records in your operating log. Cleaning - one hundred per cent according to the rules - and guaranteed compliance with the legally required maintenance intervals: two good reasons to call the technical service of BEKO TECHNOLOGIES for cleaning and maintenance. Exact measured values are imperative for up-to-date manufacturing technology, as undesired fluctuations in the process would occur time and again without them. Only exactly measured data offer the process reliability which is required in most cases to prevent expensive deficient products and damage to the production plants. With the measured values, you will be able to meet the requirements of the quality assurance directives. In addition, the data can be used to optimise the compressed-air station. 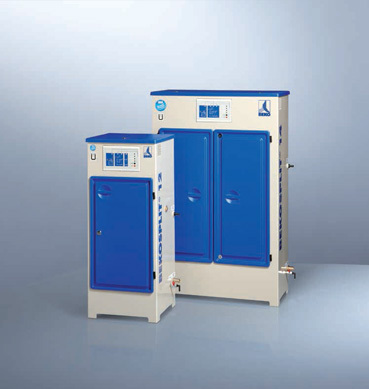 Optimisation of the compressed-air station by the BEKO TECHNOLOGIES service also offers considerable advantages to you because compressed air is an expensive energy carrier. 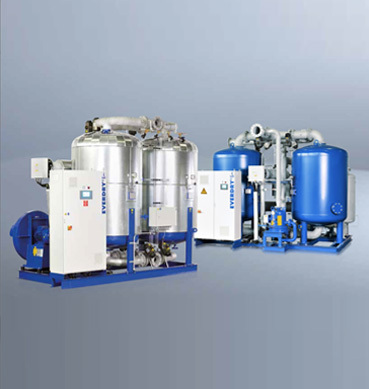 There is an enormous optimisation potential in almost every compressed-air station. Optimisation generally means enormous savings for the operator and becomes directly noticeable in the operational results. Leakage rates of 30% and more, for example, are no rarity in practice. Therefore, professional leak detection pays for itself within a very short period of time. The service team will be happy to provide you with detailed information should you have any questions regarding this subject.